This project includes the inspection, maintenance, and monitoring of the Mount Adams Retaining Wall System. The Ohio Department of Transportation selected Palmer Engineering for maintenance, inspection, and monitoring of the Mt. Adams hillside, retaining walls, and monitoring instrumentation. This project is an ongoing routine inspection and includes inspection of five retaining walls and surrounding surface areas and drainage facilities. 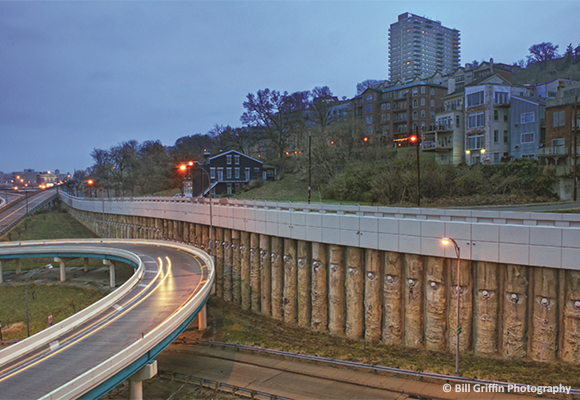 The main retaining wall, 1,500 feet long, consists of concrete piles anchored by steel tendons. An access tunnel allows Palmer personnel to perform an arm’s-length inspection of each end of the tendon anchors. In addition, inclinometer and piezometer measurements are read at specified locations along the main retaining wall. As part of the project, Palmer prepares detailed inspection reports after each routine inspection that describes the findings of the inspection and provides structure deficiency sketches, photographs, and repair recommendations. Palmer is responsible for preparing construction plans for repairs, as necessary.